Wenger threatens Iwobi – Royal Times of Nigeria. 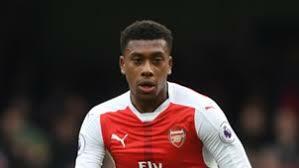 Arsenal boss, Arsene Wenger, has unequivocally declared that Nigerian international, Alex Iwobi, will be fined if the midfielder is confirmed to have been partying in the early hours of Saturday morning, just a day and a half before their FA Cup third round exit to Nottingham Forest. A video purports to show the Super Eagles star dancing at 2.37 a.m. during a party in Soho – an event that, according to neighbours, may have involved drug taking and the ingestion of laughing gas. There is no suggestion that he was involved in either activity, but it is against Arsenal’s policy to allow nights out so close to a match. Should the images be verified, Wenger will be very disappointed in Iwobi who he literally nurtured into stardom. “If that is true, he will be fined,” Wenger said at a press conference on Tuesday. “It is impossible to go out 48 hours before a game. It’s unacceptable. I will have to, of course, see him to see if that is right or not.